I didn't really start cooking until my senior year of college. My family can attest to this and would probably love to share stories of microwave Betty Crocker brownies cooked in the oven only to have the microwavable pan turn into a melted mess. What started me cooking was getting my first apartment alone. No roommates meant an empty fridge until I filled it and having to fill it meant I had to learn what to do with all of the things I brought home from the store. 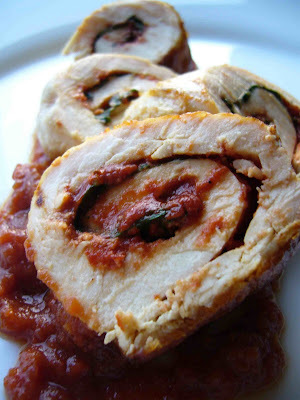 This rolled up chicken breast is one of the first things I learned how to make. I think I first saw something similar in a basic chicken cookbook, but it has evolved a lot since that first recipe that was meant for the grill. My friend Jodi is starting to get into cooking and she asked me for some ideas of chicken dishes she could make. I dug back into what I liked to make when I first started cooking and immediately remembered this dish. It's pretty quick to make and was ready in no time after coming home from a day at work. I had the best intentions of making a homemade marinara sauce to go with it, but when I got home from the store, realized I had picked up the can of Marinara rather than the can of crushed tomatoes that was right next to it on the shelf. Hate it when that happens! So, for this one, just serve it on a bit of your favorite marinara (homemade or not). Place each chicken breast between two sheets of plastic wrap and use a rolling pin to pound them down to an even thickness. Spread 2 T of tomato paste on each breast and lay the basil leaves over the paste. Sprinkle generously with salt and pepper and roll up the breasts. Secure with kitchen twine and sprinkle the outside generously with salt and pepper. Heat the canola oil in an ovenproof pan over high heat. Add chicken rolls to the pan and sear on all sides. Place the pan in the oven until fully cooked, about ten minutes. Remove from the oven and let it sit for at least five minutes before slicing to reveal the pinwheel design inside. Serve each breast over a 1/2 cup of warmed marinara. Enjoy! It looks quite advanced, but I'll have to give it a go. What do you serve it with, besides the mainara? Rice? Pasta? i will definitely need to try this one out! Hi Mike! That's the beauty of it. It looks difficult, but it's really not. This week, I would probably serve it with some brown rice and extra marinara (since I'm on the healthy kick). If you're looking for something a little more substantial, I would cook some pasta and add marinara and maybe some cooked veggies and serve the chicken on top. Let me know what you end up trying! Tasty - it's a good one to have in the arsenal! I love people's individual stories about how they got into cooking. I'm glad you did- I definitely benefit from your postings. I enjoyed reading your post. The recipe is great, so elegant and delicious looking. I'll have to try it next time I get some basil from the CSA. Thanks for posting it. That stuffed chicken looks really tasty! Mmmmmm...your pinwheels look great! I do something along the same line...but with spinach leaves and cheese. That's very funny about microwave brownies in the oven. There's nothing like learning to cook by just throwing yourself into it. Hi Rachel - I'm glad to hear you get some ideas from Apples and Butter - makes it all worthwhile! Alexa - what do you think about the CSA? I'm thinking about doing one, but since I have my own garden and am cooking for 1 - 2 most of the time, wonder if I can use it all up? Michele - I love cheese in these as well! Trying to keep it a little healthy this week. Those pinwheels looks delicious! A great idea! It sure looks delicious! Looking at the ingredients, so simple and something most of us have in the fridge. But the end result just look very gourmet!